Feted for his building accomplishments in Armagh City and throughout the archdiocese, Primate Robinson has enjoyed a reputation as a great benefactor and church builder, from the 18th century to present. It is perceived that the Primate has left a great legacy to the Church, the City of Armagh and the people of Ireland. Is this reputation deserved or overstated? 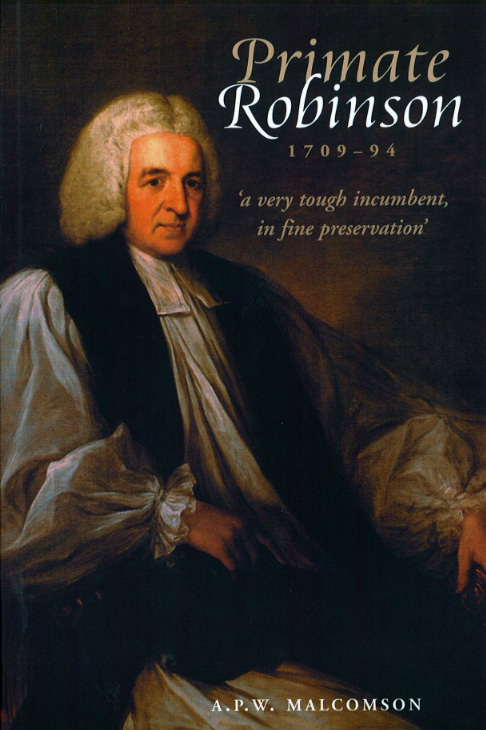 Dr Malcomson assesses the contribution of Primate Robinson through this period: his role as leading cleric of the Anglican church in Ireland, his performance in the government, and his sense of duty to his flock. Based partially upon research undertaken for his biography of Archbishop Agar, Dr Malcomson has re-evaluated Robinson's contribution and found him wanting. Were the building programmes as grand and at his own personal expense as was claimed, or was the honour bought at substantial cost to the future incumbents of the Primacy? Were his endowments in Britain and Ireland as generous as first believed or to anyone else's benefit, other than his own extended family? In re-examining Robinson's career the author provides a study that is compelling and enjoyable to read. It will be welcomed by church historians, political historians and students of eighteenth century Irish history. Anthony Malcomson was educated at Campbell College, Belfast, and Emmanuel College, Cambridge, and was awarded a PhD in history by QUB in 1970. Most of his working life was spent in the Public Record Office Northern Ireland, of which he was a director from 1988 until his retirement in 1998. His publications include John Foster: The Politics of the Anglo-Irish Ascendancy (Oxford, 1978), Archbishop Charles Agar: Churchmanship and Politics in Ireland, 1760-1810 (Dublin, 2002), Primate Robinson (1709-94): 'A very tough incumbent in fine preservation' (Belfast, 2003), Nathaniel Clements: Government and Governing Elite in Ireland, 1725-75 (Dublin, 2005) and numerous articles, essays and editions.